This must rank as one of the most spectacular and scenic hikes in the Jungfrau area, and offers jaw-dropping views in all directions. It's simply stunning - look down on the turquoise Brienzersee, look far along the Thunersee with the Niesen and the Niederhorn, admire the Grindelwald and Lauterbrunnen valleys, the impossibly majestic towering range of the Wetterhorn, Eiger, Mönch and Jungfrau, beautiful small lakes, wild scree-covered slopes, it has it all. But all this doesn't come without a price, however - this hike is tough. It's high, it's exposed, and it's long, with not many opportunities for shortening it. And there's a sizeable climb involved in reaching the peak of the Faulhorn, which adds up to a requirement for a certain amount of fitness. It's a tiring day, which may benefit from being split into two, but all the effort will, of course, be amply rewarded by the incomparable views. These pictures taken June 2002. You can also download this kmz file faulhorn.kmz to open it in Google Earth or view it in Google Maps in your browser. Or of course you can use programs like Prune to transfer the track to your GPS. It's possible to do this as a day trip from Zurich, but it makes a very long day, and the surprisingly early finishing times of the transport can catch you out (perhaps leaving you with an extra walk down to Grindelwald). A better option would be to start early from somewhere nearer, like Interlaken or Grindelwald. The hike starts from Schynige Platte, which is reached with a 50 minute trundle uphill on the historic (ie old and slow) rack railway from Wilderswil. This small station lies just South of Interlaken on the train line towards Grindelwald/Lauterbrunnen. The end of the hike (if the gondola is still running!) is Grindelwald First, the top station of the long gondola ride down to Grindelwald. From here there are regular trains back through Wilderswil to Interlaken Ost. If you do make this trip from Zurich, and you have a halbtax card, it's slightly cheaper to buy a Tageskarte plus tickets for the Schynige Platte bahn and the Firstbahn (total CHF 81), rather than a regular return ticket. When planning your trip, make sure you check both the status of the hiking route and the timetables for the transport before you go - at present (August 2003), the Firstbahn closes at 5pm and the Schynige Platte bahn closes at 6pm. See the links under 'More info' below for online information. 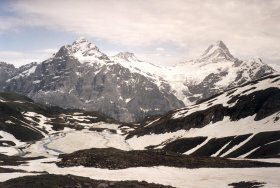 Schynige Platte sits at 1970m on a ridge between the lakes of Interlaken and the valleys of Grindelwald and Lauterbrunnen. 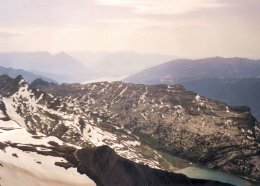 This hike follows the ridge Eastwards towards the Brienzersee and Grindelwald, rising up over the Faulhorn before dropping past the beautiful Bachalpsee. 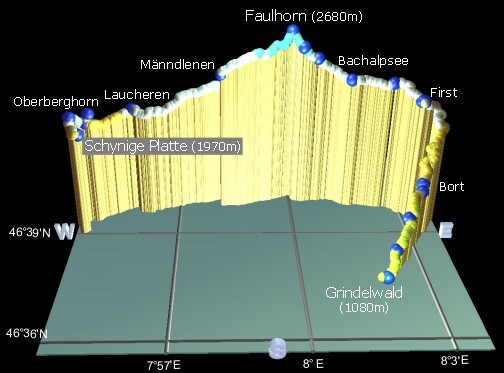 This graphic shows a 3d plot of the hike, including the additional descent into Grindelwald (due to the early closure of the Firstbahn). Silver points are above 2000m, light blue points are above 2500m. Resisting the lure of "Teddyland" (if you can), follow the signs for the "Panoramaweg" past the restaurant and the slides, and uphill round rocky switchbacks towards Daube and Oberberghorn. In places the ridge becomes fairly narrow, and the Panoramaweg is certainly aptly-named, from the lakes far below to the peaks high above. Bring lots of camera film. Oberberghorn is a sharp rocky peak with a clearly visible wooden stairway leading up the last stretch. This stairway is the only way up or down though, making this an optional side-trip before continuing along the Panoramaweg to Laucheren. Shortly before Laucheren, the Panoramaweg doubles back to return on a lower route to Schynige Platte, but the Faulhorn signs lead straight on and up into much wilder-looking terrain. 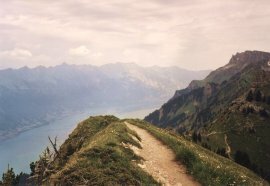 Climbing up along the side of the ridge, past the clanging sheep bells, the stratified rocky cliffs above contrast with the small lake below and the shimmering Brienzersee, as the path slowly climbs up to the ridge. Here it takes a sharp turn back to the right, and continues to climb up to Männdlenen where a building site marks the pass, and perhaps a future restaurant. The signpost is now missing but even so the path is obvious - carry on climbing and turn left to follow a beeline for the Faulhorn. There was plenty of snow here in mid-June, requiring some care on the traverses, so more cautious readers may prefer to wait until mid-July for better conditions. The snow makes progress slower but at the time of writing the path is perfectly passable with care, and there are no navigational problems. The stretch towards the Faulhorn is an exhilarating climb, with the spectacular views giving a real sense of altitude. The final assault on the summit becomes quite steep (marked 'Gratweg' or ridgeway), but worth every step for the 360 degree views from the very top. The only difficult part is choosing which direction to gaze in as you catch your breath. Leaving the summit down to the right, the signs for Bachalpsee and First lead you swiftly downhill past marmot colonies, until the tranquil lake seen on so many postcards comes into view. In mid-June there was still plenty of ice cover on this lake, but the sky-blue reflections and the snowy peaks in the background make for beautiful snapshots. Follow around the left-hand side of the lake and continue on the last stretch gently downhill to First. This stretch of the hike is also cleared for Winter walking, and ambles around the side of the hill past more marmots and maybe some chamois, until the chairlift cables and the gondola station at First come into view. The viewing terrace here is the last chance to bask in those spectacular views before enjoying the long gondola ride down to Grindelwald (or a nice long walk down instead!). The walk down drops steadily another 1100m, and reaches Grindelwald station after around 1h50 to 2h. 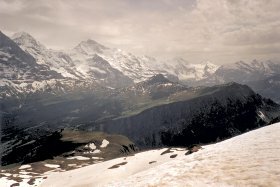 There's a good panoramic map of the whole Jungfrau area, both in Summer and Winter, at jungfraubahn.ch (available as a free leaflet from Wilderswil station), and the jungfrauregion.org site shows whether the hiking routes are open	or not. Unfortunately the sites gofirst.ch and schynigeplatte.ch with timetable information have disappeared. Page last updated September 2006. Feedback welcome at mail@activityworkshop.net.